It has been an emotional few weeks: I lived through a not coup d’etat. November 21, 2017. 11:11am in New York City, 6:11pm in Harare: Ten minutes ago, as I emerged from the subway, my phone burst into a staccato of beeps, and a mosaic of alerts populated the screen. BEEP. “Did He Resign?” asks a cousin. BEEP. “What just happened?” a Zimbabwean friend in Australia asks. BEEP. “It’s on the radio!!!!! !” This one, from London. BEEP. “IT HAPPENED!! !” Dallas, this time. I check Twitter (the Twitterati usually know everything before anyone else). Nothing, yet. On Facebook (almost always the last to know) my friend Palesa in Zimbabwe has broken the news. Her latest status update is a bunting of Zimbabwean flags punctuated with an excess of exclamation points. I need more. On the Al Jazeera English livestream, my most trusted Zimbabwean reporter, Haru Mutasa, is live, interviewing a crowd of jubilant Zimbabweans. She confirms it, and I weep, right there on the crowded Fifth Avenue sidewalk. This morning, when I woke up, WhatsApp (the undisputed public sphere for Zimbabweans) was abuzz with screenshots of the press statement by exiled former Vice President, Emmerson D. Mnangagwa (or ED, as he is known in the Zimbabwean WhatsApp world). There was hardly any commentary — since the government started arresting people for “cyber crimes” (which included speaking negatively about President Mugabe), Zimbabweans, already wary about speaking publicly about politics, were uncharacteristically cautious on social media too. Twitter users, however, were unbothered. The #Zimbabwe #NotCoup discussion was alight with fearless analysis. It was unsurprising to me that today, seven long days after this rollercoaster began, virtually everyone in the discussion was still calling for patience, for calm. Optimism is the weakness and the strength of the Zimbabwean disposition. Optimism kept us at home all these years, instead of marching in the streets, and optimism kept us out of a war this week. And so, despite ED’s statement, in which he “confirmed” some facts, “declined” an offer, “appealed” to the President, “promised” future action, “looked forward” to other events but said nothing concrete, what I heard from Zimbabweans was frustration, and still, hope. And that hope would be rewarded only a few hours later. Mugabe is gone. Dad (8:31am): Stereki [Very]. Going fishing tomorrow. Were you spooked by something? Me (9:47am): Unconfirmed reports that the military has taken over ZBC offices. If that’s true, this is a coup in action. To back up my concern, I sent him a barrage of Twitter and Facebook screenshots — anonymous nobodies who claimed to know somebodies who knew somebody in the know — were reporting that something was happening. The same three videos of military troops being driven into the city were circulating in a frenzied loop on every social media platform I subscribe to. I panicked. The ubiquity of smartphones and social media has meant that even though I left home, it was only in the physical sense. I have lived every crisis, familial and social, as though I was still there, except everything happened half a day late in my world. When my mother went in for surgery last year, I was in the pre-operation room with the family, listening to the conversation while staring at the ceiling (I guess someone put the phone down and didn’t think to prop “me” up). I was there immediately post-op, getting live updates on her condition at 5am. When the generator at home died, I knew about it almost immediately, and brainstormed ways to send money home to help fix it (in a society with a cash shortage and underdeveloped electronic banking infrastructure, everyday things like international bank transfers become logistical nightmares). I live birthdays, and power cuts, deaths, and fuel shortages, and the minor nuisances of daily life with my family, and yet I have not lived at home in over fifteen years. Being in the diaspora means, for the most part, physically living away while emotionally, financially, and politically being an active, vocal member of my native society. When the Zimbabwean government introduced the new ministry of cyber crimes, I, in New York, modified my online behavior. I have plans to visit home, and worried about an arrest at the airport over a throwaway tweet. If I made a political comment that might be considered subversive, I make sure to advise the recipient in Zimbabwe to delete it, lest their phone be searched. I am cautious about what I retweet, who I quote online. I considered using a pseudonym for this article. You see, apart from my body, I still live in Zimbabwe. My dad, like my friends at home, laughed at my panic. “I drove into town and didn’t see a single tank,” he said, chuckling. My anger heightened. What was he doing in town? Why would he even go there? He had every intention of making his fishing trip the next morning. My cousin seemed just as unperturbed. She had a business trip the next day, and had no plans to cancel. I thought they were insane, and insanely irresponsible. Glued to my phone, I was among the first in my family (the others were in the diaspora, too) to report the news that that the ZBC (the state broadcaster, Zimbabwe Broadcasting Corporation) headquarters were under the control of the military; the UK and US embassies were advising their personnel to stay home the next day; the airport was now closed (then not closed, but heavily guarded, then closed again). While my family slept, the diaspora in London, Sydney, California, kept up with the news: someone’s friend could hear a firefight in Borrowdale, where the President’s personal residence (known as “Blue Roof”) was; a circulating voice note advised that the First Lady, Dr. Amai Grace Mugabe (“Dr.,” because she had been awarded a PhD after 2 months of study; “Amai” as an honorific for “mother of the nation”) had left the country “at 3pm” and “was in exile in Nairobi.” Someone else said some ministers had been arrested. ZBC was playing war songs, according to someone who knew someone still up and watching local TV in Zim. Eventually, my day ended, and I had done nothing else. I slept. I awoke to more beeping — the soundtrack to revolution. Timezones meant that I was playing social media watch tag with my Australian fellow diaspora. At 6am NY time, my shift began. It was 10PM in Australia, and my friend tagged out — she had work in the morning, but updated me on what I had missed: The Head of the ZDF (Zimbabwe Defense Forces), General Joseph Moyo appeared on ZBC to announce what was being called a #NotCoup on Twitter. The President was under house arrest, ministers had indeed been detained, and others were still on the run. I promised her updates while she slept. At home, Zimbabweans reacted as they always do, with humor. The memes were swift to come, biting in their sarcastic hilarity. “Time for tea and coup cakes in #Zimbabwe. This just got properly weird,” wrote Twitter user @edwardcropley, captioning an image of Commander Chiwenga and the President shaking hands, released by the military as proof of the President’s wellbeing under their care. #Coupcakes became the first in a series of defining memes this week. Another one, #GeneralBae, would emerge during the #SolidarityMarch organized by the (Chimurenga) war veterans. 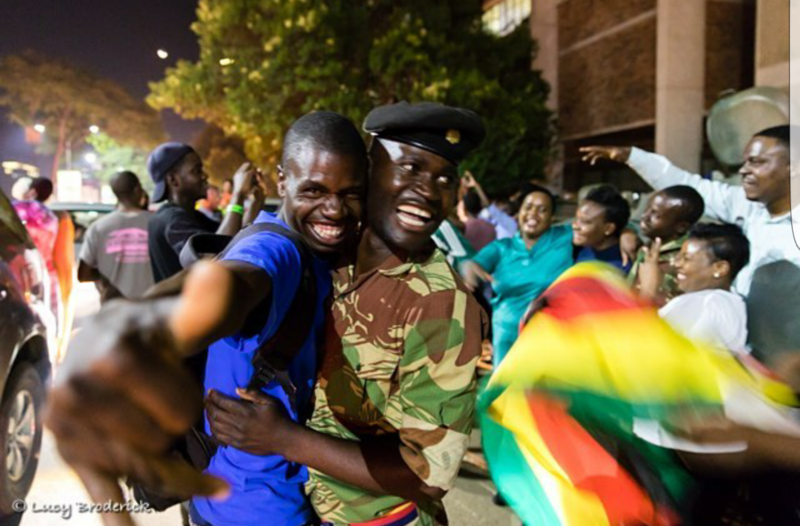 Young women, wrapped in Zimbabwe flags, would stop soldiers in tanks on the street and take selfies — they may as well have whisper-sighed “my hero.” It was a heady, topsy-turvy day. #MusojaBae (for Soldier Bae) was born, and of course, as the man in charge, Commander Chiwenga was knighted #GeneralBae, bringer of liberation. I’m getting ahead of myself. Events unfolded too quickly, and not quickly enough. In those first few days, it was expected the President would resign. An “announcement coming soon,” message made its way around the world every 80 minutes, and sleep, like the pending resignation, was elusive. I had lived 32 of the 37 years of Mr Mugabe’s rule; I wasn’t about to miss this moment for something as trivial as sleep. One day turned into two, and then three. Real news was scarce, rumor abundant. Whole theses were sent around, copied and pasted into the body of the message to avoid the expense associated with downloading documents (Zimbabwe has some of the most expensive data charges on the continent). The military assured us all was well, that in a #notcoup, the constitution matters, and must be abided by. The leaders of the continent, organized in the African Union, floundered. The South African President made a vague statement, and then sent an envoy to Zimbabwe to meet with the military and the President. WhatsApp said the South African envoy was declined entry at the airport, but the next day he appeared (wearing much-commented-on colorful socks) in the ubiquitous staged photographs of meetings at Blue Roof. There was a suggestion that the regional organization of states, the SADC (Southern African Development Community), would need to interfere. This was met by a resounding “NO” from across Zimbabwean social media. We didn’t want international intervention, which we feared would lead to a war; we were going to wait this out. Apparently, the outside world had already intervened. Reports came out suggesting the #notcoup was planned in China, with the knowledge and conditional approval of the Chinese government, and a diplomatic shrug from the Americans. Still, “no SADC,” we said. Think pieces were written. Nobody quite knew what to say, and we certainly didn’t know what to think. Is it a coup if it goes on for days, and nobody gets summarily executed? Is it a coup if the President is under house arrest, but free to preside over (and nap at) a university graduation ceremony, in which he conferred a degree to the wife of his captor? Is it a coup if the assumed ascending leader is in exile, and holds no political office or party position? Western media certainly could not understand it, and so resorted to profiles of Mugabe. The anticipatory post-mortem of his presidency had begun. Still, for now, we had a President, and he was refusing to resign. The War Veterans came out and condemned him, and his ambitious wife, who, until that fateful day, had been vying to succeed her husband — now, she was either in exile, or under house arrest at Blue Roof, too, depending on which social media platform you favored. On November 18th, we marched. At home, in Zimbabwe, we marched. My family sent surreal photos, posing with armored tanks, with soldiers, with each other. The streets were jubilant, they said, “electric.” It felt like a celebration. Videos of dancing, singing, joyful Zimbabweans marching to State House — State House, where, in years gone by, one would get shot at before questioning, for slowing down — to demand the resignation of the President. This was unheard of, unprecedented. You cannot do that in Zimbabwe. It is illegal to speak against the President, as Martha O’Donovan, an American living in Zimbabwe, found out two weeks before this upheaval — she was arrested for calling the president a “sick man” on Twitter, and released with a $1000 bail. Yet we marched. We at home marched to State House and to Blue Roof, and we in the diaspora marched in London, in Australia, in Washington DC, in New York, in the Netherlands — a rolling wave of preemptive celebration across time zones. I listened to the Zimbabwean national anthem on repeat on my way to the protest at the Zimbabwean Mission to the United Nations in New York. I cried tears of joy, of relief, of a reborn hope for a home I had not lived in for almost half my life. “Happy Independence Day,” we said in greeting. Everyone was smiling. We danced, we sang, we spoke. This was freedom: Mugabe was going. Or so we thought. “Announcement coming soon” started circulating almost immediately when I woke up on November 19th. Confident in the power of our collective demonstration, we believed the President had no choice but to resign. By midday, a photo of ZBC trucks outside State House served as proof that our hopes were about to come to fruition. My Australian counterparts were asleep, but in the US and the UK we were awake. I hadn’t slept well in days, but I was determined to watch this speech. I scoured social media for information, but it was mostly conjecture, nothing validated. I tuned into Al Jazeera English, where Haru Mutasa was on the ground, doing interviews, giving analysis. I watched that segment three times over the next three hours, and still, nothing. I turned the volume up so I wouldn’t fall asleep, and decided to rest my eyes. Three hours later, I woke up in a panic. I had missed it! Thank God.“What did I just watch?” a friend on Facebook asked nobody in particular. “I don’t get it. So he didn’t resign?” my cousin asked in the chat group. “?????? ?,” wrote a friend in South Africa. “#NotCoup, #NotResignation,” another friend wrote. I had slept through it, but not the “it” I was waiting for. I’m glad I didn’t watch the speech—it would have broken my heart. “The President woke up the nation, and all he said was goodnight,” a friend in Zimbabwe wrote. #AsanteSana was trending; apparently, he ended his speech in Swahili. The conspiracy theories started immediately. Messages started coming (I got the same one from my cousin, my mother, my brother, and my friend) about how this was a master stroke, and definitely planned by the military because of some constitutional clause. I didn’t understand it, but I wanted it to be true. Another person had zoomed in on someone’s hands holding a folded stack of papers and putting them under their seat, “obviously” hiding evidence of something. “He read the wrong speech,” was a Twitter consensus position, as was “The Old Man outplayed the generals” by somehow reading a meandering non speech instead of his “real one,” in which he was supposed to resign. The Twittersphere blamed him; Whatsapp blamed President Zuma of South Africa. Apparently, Zuma had called the President, who was willing to resign two days ago, and convinced him not to. The rationale behind this theory was unclear (something about the African Union and SADC being bound by treaty to interfere if he could just but hold on until Monday), but it was circulating as fact. I later regurgitated that piece of information to curious non-Zimbabweans asking me what was going on. In reality, I had no idea. Not many of us did. We were deflated. Monday (20th November) came, and social media agreed there was only one way forward. The Party would have to expel him, as was the rumored next step in this #notcoup. To understand the significance of this, you have to know that the ruling party in Zimbabwe, ZANU PF, is synonymous with the President. To imagine a Party without him was impossible only one week ago. And yet, with disingenuous speeches decrying the corruption and many abuses of the President and “certain people around him” (read: Mrs Mugabe and her supporters in the Party), by people who profited for years from those “abuses,” the President was removed as head of the Party (and Mrs Mugabe and her allies were removed from the Party altogether). After the vote, the room erupted in cheer, and with but a few seconds time delay, Zimbabweans joined them with a digital chorus of celebration. We would overlook the hypocrisy, if only to achieve our primary goal: Mugabe must go. Consensus between my favored social media pseudo intelligence officers was that the pressure was too intense, and the chess master was running out of moves. He would resign. He didn’t. He called ED home, out of exile in South Africa, to talk. ED declined, and released a statement. President Mugabe called for a meeting of the cabinet, and Twitter says they declined to attend. Still, he remained in power.